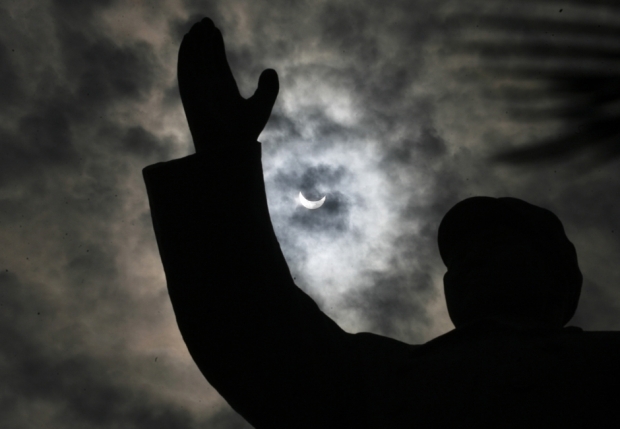 The sky goes dark over the statue of late Chinese leader Mao Zedong in Wuhan, Hubei province, on July 22, 2009, as the lunar shadow, or “umbra,” moves over the city during a solar eclipse. Harvard University Asia Center, 320 pp. This article was first published in the June 21, 2012 issue of The New York Review of Books. Mao’s Invisible Hand is one of those books that make one feel good about scholarship. It describes inner workings of Chinese Communist society about which few nonexperts know anything—it may even surprise the experts—and it will interest anyone professionally interested in China. Its central purpose is to explain how China has escaped the disintegration of other Communist states; but the contributors to the book do not cram their research into a template that promises more coherence than Chinese realities can provide. In their first chapter, however, Perry and Heilmann contend that the post-Mao regime has “become increasingly adept at managing difficult challenges ranging from leadership succession and popular unrest to administrative reorganization, legal institutionalization, and even global economic integration.” Yet there is no implication anywhere in this book that the editors and their colleagues approve of the regime’s strategies; they are concerned to show how they evolved and actually work. They state that the regime’s “staying power” is observable “up to this point” and has very dark sides: official corruption, the ruin of the environment, and no civil liberties. “Up to this point,” as is usual with volumes based on conferences, can mean some years ago. Right now is an even worse time for Chinese civil liberties, with the Nobel Peace Prize winner Liu Xiaobo behind bars, many of his supporters and human rights lawyers detained, and the arrest in 2011 and release eighty-one days later of the now largely silenced artist Ai Weiwei—to name only two of the nonviolent dissidents who have been subject to repression. Chen Guangcheng has made it to NYU but his wife and associates have been treated brutally. a signature Maoist stamp that conceives of policy-making as a process of ceaseless change, tension management, continual experimentation, and ad-hoc adjustment. The editors insist this has been a relatively recent development in governance that is understood neither by political science nor theories of modernization. China’s record poses a paradox for those convinced that deviations from the standard modern assumption about progress—that economic development will lead to more open societies—must fail. The Maoist strategy, the authors write, began during the thirty-year period starting in the early 1930s when the Party was driven out of the cities into the countryside and the Long March of 1934–1935 took place from south to north China, with guerrilla headquarters being established at Yan’an in 1936. This meant surviving in some of China’s poorest hinterlands and relying on improvisation. The authors of Mao’s Invisible Hand argue that China’s post-Mao leaders, especially those like Deng Xiaoping whose memories reached back to the darkest days before the 1949 revolution, similarly used new ideas and techniques for purposes that Mao would have condemned, especially for reforming the economy, but that reflect his unpredictable and experimental approach. Central to understanding this sometimes disastrous, sometimes successful “guerrilla policy,” the editors emphasize, are its resilience and adaptability. Resilience means absorbing shocks when things go wrong; adaptability is the capacity to find ways of being what they call “proactive,” “reactive,” and “digestive,” together with the determination to try something new, thus making use of fresh challenges and opportunities. What Mao’s successors have always held in reserve is their power to crush those who stray from what Maoists call “the commanding heights” of priority and command. The editors, and for the most part their contributors, do not duck the fact that many of the “grievous and growing social and spatial inequalities” attendant on guerrilla policymaking “would surely have undone less robust or flexible regimes.” They describe, too, vast upheavals like the hundreds of uprisings in the spring of 1989 that the leadership violently repressed. Decades earlier, as they dealt with civil war, Japanese occupation, and leadership divisions within the Party, “Mao and his colleagues had come to appreciate the advantages of agility over stability,” although, I would add, stability is exactly what they invariably claim to be preserving no matter what changes they make. Mao’s closest comrades, including Deng and Hu Yaobang, absorbed the chairman’s “work style,” which the editors, brilliantly, in my opinion, sum up as marked by “secrecy, versatility, speed, and surprise”—in short, politics as warfare. The leaders carefully keep for themselves the power to make decisions about strategic policies and the overall direction of the economy; but they encourage much local initiative—unless it goes wrong or goes too far astray. In that case all alliances can be broken or newly reestablished. The guerrilla style means maximizing the leaders’ choices and initiatives “while minimizing or eliminating one’s opponents’ influence on the course of events.” In the face of most informed opinion at the time, including mine, this is what enabled Deng and his colleagues, as they dismissed in 1989 their high-ranking, long-term comrade Zhao Ziyang, not only to survive Tiananmen but to emerge tougher and more successful than ever, in part, as this book shows, by buying off some of their severest critics. The adaptive capacity of China’s non-democratic political system offers a radical alternative to the bland governance models favored by many Western social scientists who seem to take the political stability and economic superiority of capitalist democracies for granted…. [These social scientists should take] a sober look at the foundations of innovative capacity displayed by non-democratic challengers such as China. A capacity, the editors point out, that can also be damaging and dangerous for large parts of China’s population. Tracing the origins of the Maoist experimental method, the contributors—astonishingly, at least to me—reach back to John Dewey, whom Mao heard lecture. They go on to describe Mao’s involvement in rural health care, the function of unofficial or voluntary organizations, the uses of the law and the press, and the methods of local administration. In every case we see two things at work: local or at least noncentral bodies trying things out, being observed or finally noticed at the center; and central control then being brought to bear, including or adapting some of the bottom-up ideas and actions, while snuffing others out. This statement strikes me as ironic when we consider Mao’s early violence against those who appeared to defy him.2 Indeed, the Party’s basic position, which is to eliminate its enemies, is a weapon he handed down to all his successors. The perception that enemies, including fellow Party members, must be destroyed appeared as early as 1930 when Mao, still only a senior Party member, began the “AB”—the “Anti-Bolshevik”—campaign that led to the executions of some thousands of Party followers he deemed “objectively counterrevolutionary.” After 1949 this violence intensified. Such brutality was characteristic, too, of Deng Xiaoping, who as Party general secretary oversaw the 1957 anti-Rightist campaign, resulting in the purge of hundreds of thousands, and who, in 1989, ordered the internal exile of the Party’s general secretary Zhao Ziyang and the Tiananmen killings. In 2010 Deng’s successors perceived the wholly nonviolent Liu Xiaobo, the Nobel Peace Prize winner, as a danger to their rule and, with considerable success, threatened foreign ambassadors who had been invited to Oslo to see the prize awarded to Liu in absentia, discouraging several from attending.3 This was not experimentation, but Maoist-style paranoia and persecution. Even without violence, as Heilmann observes, “The party center always reserved, and regularly exercised, the power to annul local experiments or to make them into a national model.” By the 1950s, moreover, experimentation was weakened by the spread of central directives, especially during the ill-fated Great Leap Forward and the decade of the Cultural Revolution between 1966 and 1976. After Mao’s death in 1976, top-level backing for experimentation, always under central supervision, resumed. Since few, if any, of China’s new voluntary associations and nonprofits are truly autonomous from the state, characterizing them as civil society seems premature. Indeed, many question whether China has ever had anything approaching a civil society. Voluntary groups, she writes, existed in large numbers in the Republican period of the late 1920s and early 1930s, when their activities were circumscribed by numerous regulations. Those strictures were loosened in the United Front period during the anti-Japanese war. After the Communist victory in 1949, a series of “anti-corruption” campaigns attacked voluntary associations. For a time only “state-sponsored groups such as the official labor union and the Red Cross remained.” In the 1990s, a more relaxed attitude emerged, leading to the vast expansion of voluntary organizations, always closely observed by officials from the center. Such organizations are part of a hierarchy determined by the degree of approval they receive from the state, with the women’s federations, youth leagues, and trade unions at the top. Always suspect, religious associations come next, and are under much firmer control, Dillon writes, than the groups in the first category. Finally, there are large numbers of informal and potentially illegal groups. Recently, a man was imprisoned for attempting to organize a group protest against the contamination of powdered milk, which had caused a few deaths and the illness of many thousands of children. Also placed under scrutiny—and in some cases detained for questioning—were hundreds of the signers of the manifesto Charter 08 calling for basic democratic freedoms, which led to the eleven-year imprisonment of Liu Xiaobo. China’s legal reforms have confounded those who argue that significant [legal] reform will necessarily give rise to political challenges to the state or that the party-state is not serious about such reforms other than as a tool for policy implementation. It would be a mistake to think of China’s legal institutions as a “legal system.” Legal institutions in China, especially the criminal law, are part of a political system that ultimately directs their application and their use. They are essentially grounded on the dominant notion that law is to be used to keep the Party in power. The maintenance of a Leninist disciplinary core in the media system during a process of rapid commercialization ensures the media system’s continuing subordination to the CCP’s ideological objectives. No matter how they [other businesses] are to be reformed…it is absolutely impossible to change the nature of party journalism in the slightest sense and change its relationship with the party. Behind these economic blandishments lies Mao’s invisible hand, the inspiration and justification for those who, in June 1989, ordered the murder of the students and workers in Tiananmen Square who had the temerity to shout “Down with the Party!” and “Down with Deng Xiaoping!” As so often in Party history, the Beijing spring was an experiment that had fatal consequences and is worth keeping in mind when we hear of the experiments undertaken within the party-state.